The EZ-Daisy tightener can be initially tightened with a 1⁄2 inch drive ratchet. 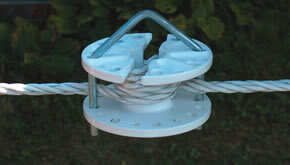 This powder-coated white, aluminum tightener is best for use with rope or light gauge wires. These strainers should not be used with coated wire. Use Kencove’s EZ–Daisy Handle (TFD) or the Rapid Tightener (TFDR) to make installation fast and easy.